S&S Contractors recently needed to locate septic drain lines under a concrete floor in order to know where they could access the lines. 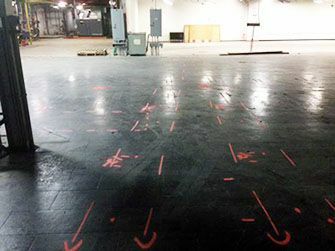 Before drilling into the concrete they wanted to make certain they knew exactly where to find the lines to cause as little damage to the floor as possible. S&S had heard of Ground Penetrating Radar Systems, LLC, and new they could locate underground utilities. When they called the technician that covered the Auburn area they were pleased to hear he was available to complete the project that day. Jim Bell of the Upstate, New York office mobilized to the site and began marking out all of the utilities that were located in the area the drilling would take place. In addition to finding underground utilities, and storage tanks, Ground Penetrating Radar Systems has the ability to locate and map out rebar, post-tension, and conduit prior to saw cutting and trenching, and in some cases unmarked graves. GPRS, LLC. are pleased to announce the opening of an Upstate, New York office servicing the Buffalo, Rochester, Syracuse, Ithaca, Binghamton, and Albany areas. If you are interested in obtaining more information or a quote please visit our Contact Us page for a local representative near you.